News from the IAFF FrontLine! --12AUG15 US Pizza Hosting Fundraiser for NLRFD Brother. We have just learned that U.S. Pizza Company at 301 Northport Dr in Cabot, Arkansas is hosting a fundraiser for Adam Moreno's family. Sorry for the late notice on this, but the fundraiser is TODAY!! As in right now! As most of you know, Adam suffered a catastrophic loss due to a house fire over a week ago. The outpouring of help from the community has been beyond belief. We would like to name all of the organizations, communities and people who have helped, but the list would be long and I'd probably accidentally leave someone out. US Pizza will donate 10% of all receipts from 4pm to 10pm to Moreno's family. If anyone is in the area and looking for a good meal, we'd like to suggest killing two birds with one stone: eat good pizza and help out a Brother in a time of need! 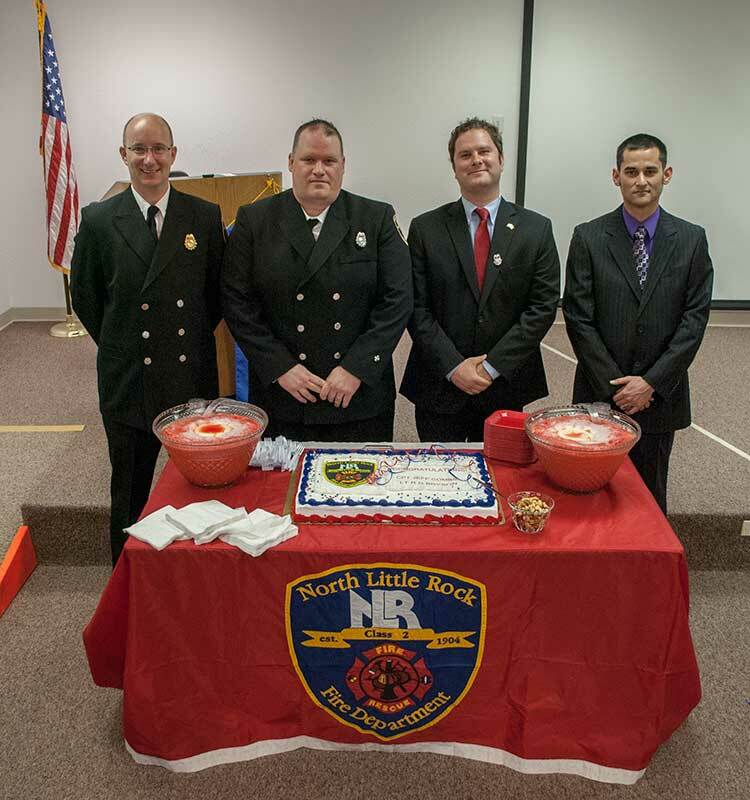 21MAY15 -- The North Little Rock Fire Department is pleased to announce the promotion of two of it's officers, along with the hiring of two new firefighters, at an official ceremony held on April 3rd, 2015. Pictured are (from left to right) Cpt Jeff Combs, Lt Dan Bryson, FF James Stanley and FF Michael Mitsunaga. Cpt Jeff Combs was originally assigned as Lieutenant on Engine 7 in Lakewood on C Crew, where he served the Department as a Paramedic. With his promotion, he has been reassigned to Rescue 5 in Park Hill as Captain on B Shift. Lt Dan Bryson worked formerly as a firefighter on Engine 3 in the Baring Cross community; with his promotion, he has been reassigned to Truck 7 in Lakewood on C Shift. FF's James Stanley and Mike Mitsunaga were both hired from previous fire department backgrounds. Stanley was formerly with the Pine Bluff Fire Department, and Mitsunaga comes to the NLRFD from the Searcy Fire Department. Both Stanley and Mitsunaga enjoy previous Union memberships, and have already become members of Local #35. 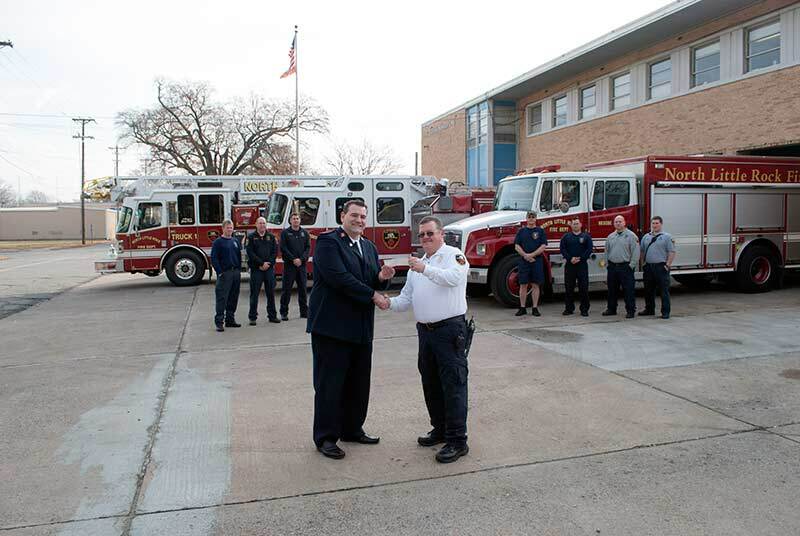 4FEB15- At an emergency meeting on Monday, February 2nd, the NLR City Council unanimously approved the purchase of three new fire trucks for the NLRFD from Pierce Manufacturing. The three new Pierce Sabers are now in process for delivery and are expected to arrive by the beginning of March. More information will be made available after they are received by the Department. Working with the Arkansas Professional Fire Fighters Association, IAFF Local #35 met today at the Arkansas State Capitol. Dec 19, 2013 - Working with the Salvation Army, IAFF Local #35 raised $3,500 for it's annual Christmas Bikes program. 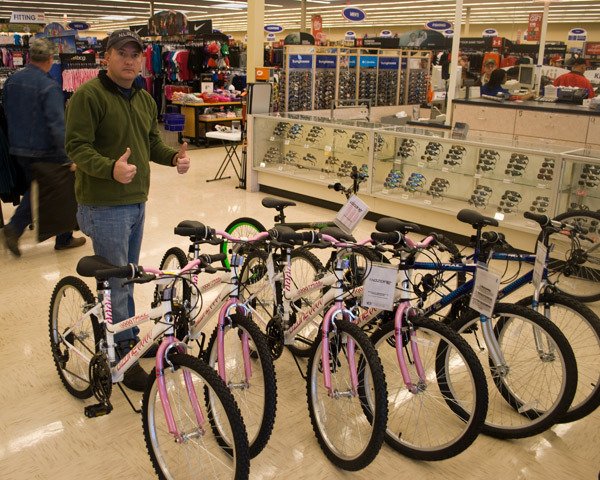 For over 10 years, Local #35 has raised money to provide bicycles to needy children for Christmas. Three years ago, Local #35 partnered with the Salvation Army's Central Arkansas Area Command to participate in their Christmas "Angel Tree" Program. The Angel Tree Program accepts applications from pre-screened families in Arkansas for Christmas "wish lists" for their children. A combination of dedicated volunteers and generous contributions from the public are used to make these Christmas dreams come true. In Arkansas, over 5,000 children will find something under the tree that otherwise would not have been there, thanks to the Angel Tree program! Local #35 is proud to participate in this program by collecting money specifically earmarked for bicycles; occasionally, we even receive bicycles themselves which are always welcome! 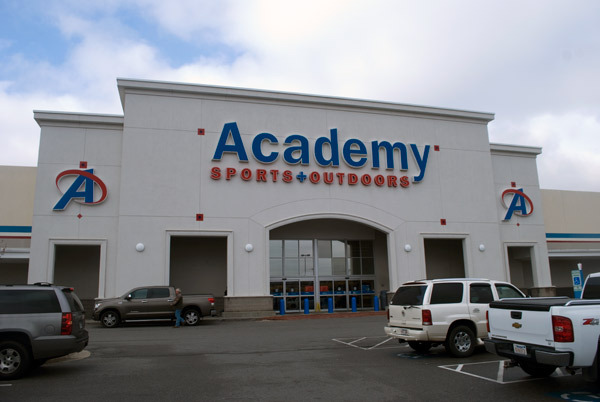 (In 2011, while buying bicycles for the program, a customer in line behind us paid for an extra one right out of the box after she found out what we were doing! True Christmas spirit!) We are pleased to say that each succeeding year has seen even greater contributions. It is important to know that all contributions go directly to the purchase of bicycles! There are no service charges, administrative fees, etc. Time, effort and gas used to make all of this happen are contributed by members of IAFF Local #35. For more information about the Salvation Army's programs, either visit their website HERE or contact Captain Roger Glick with the Salvation Army. 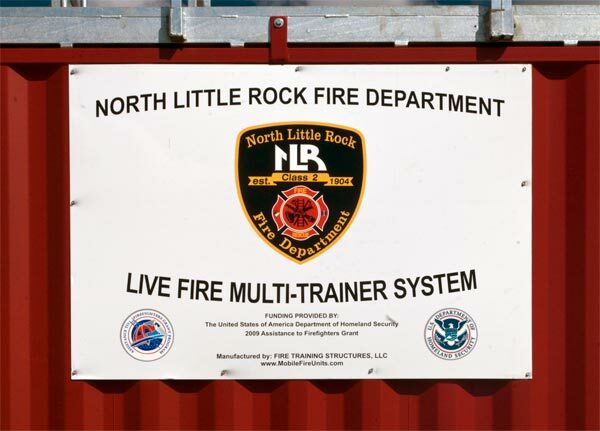 The North Little Rock Fire Department took posession of a new training equipment system in July of 2011. 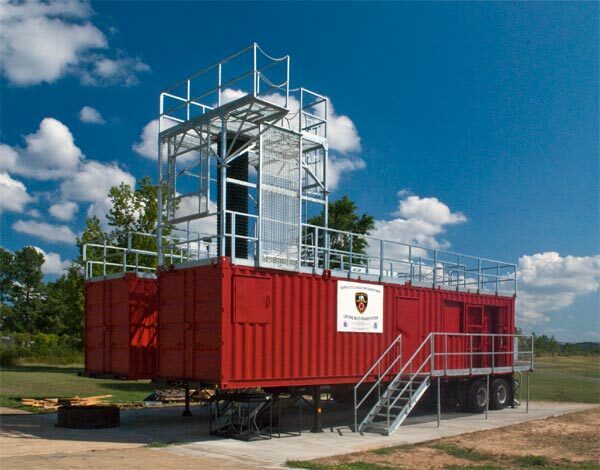 Wholly funded by federal grant money, the Live Fire Multi-Trainer System will provide firefighters in the NLRFD as well as surrounding Departments the facilities and equipment needed to learn and sharpen the skills of their craft. Built around two full size metal trailers with attached catwalks and platforms, the System features many specialized training elements. At the core are the trailers themselves. They are enclosed spaces with custom configurable walls which permit the trainer to set up a wide variety of different mazes. When filled with burning material and smoke, these very closely simulate the smokey, hot and completely dark conditions of the interior of a burning house. This is the closest thing to reality for training firefighters to operate in "live fire" conditions. In the 1990's, the NLRFD trained in live-fire exercises by burning down derelict homes, training inside of them while they were burning until the structures had sustained enough damage that they were no longer safe... even for training. They were then allowd to burn down or were bulldozed. The practice of intentionally burning abandoned homes for training was discontinued in light of new environmental regulations. Meeting these regulations prior to burning was extremely cost-ineffective. The practice was discontinued. Along with live-fire exercises, the Multi-Training System allows firefighters to practice additional non-fire related skills like high angle rescue, confined space rescue, forcible entry, ventilation practices, and other necessary skills of the trade. 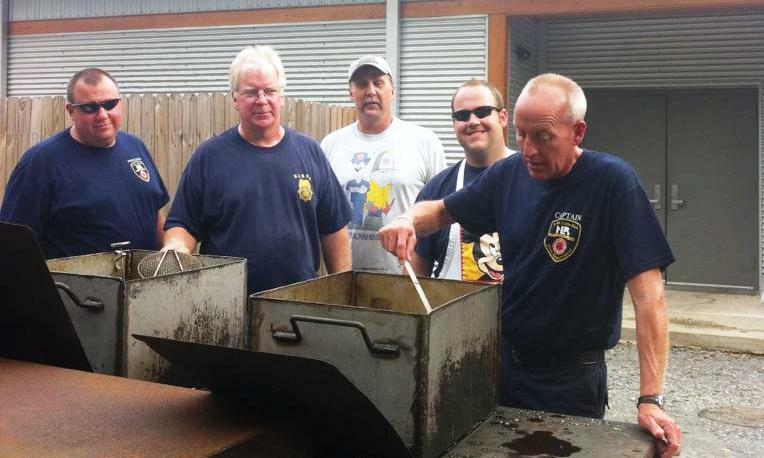 Several members of Local 35 donated their time recently to help out at Camp Sunshine, a four-day-long camp for children who have suffered burn injuries. Lt. Chris Patton, Lt. Alana Merritt and Firefighter Brian Thomas volunteered as camp counselors. Lt. John Miller and Lt. Mark Wittenburg worked behind the scenes as volunteers. Lts. Miller and Chris Patton are also on the planning committee of Camp Sunshine, working year-round to plan each summer’s session. On the second day of the camp, members of Local 35 cooked fish, hushpuppies and French fries for the entire camp. Those volunteers were Tom Cross, Capt. Gerald Tucker, Firefighters Jeremy Reed and Sean Walker. Fifty-two campers attended Camp Sunshine this year, ranging from ages 3 to 25. Most have Arkansas connections, including living in Arkansas and being treated at Arkansas Children’s Hospital’s burn unit. In addition to Arkansas firefighters, many nurses who worked first-hand with the campers in the early stages of their recovery. The camp is located at Camp Aldersgate in Little Rock, and provides four days of crafts, games, contests, a dance and field trips and allows burn victims to meet and bond with people who understand where they have been. The camp is in its 22nd year and is funded, in part, by firefighter unions from around the state. 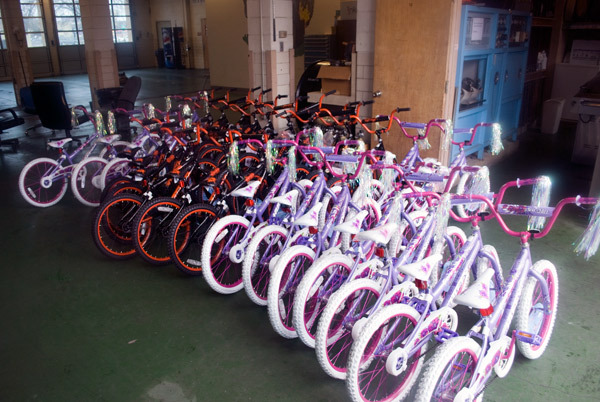 Partnering with the Salvation Army, Local 35’s Christmas bike program is underway. The Local has collected over $2,600 dollars and has already purchased 42 bikes for children and received additional donations of bicycles for a total of over 46 bikes this year! Members of Local 35 worked hard to secure donations and purchase the bikes, which were then delivered to the Salvation Army warehouse in Little Rock to be distributed this season through that agency’s Angel Tree Program. By filling out an Angel Tree card detailing what they’d like for Christmas, children in North Little Rock and the Pulaski County area who specifically asked for bikes this year will be matched by age to the bicycles donated by our Union. According to Secretary Alan Tetkoskie, just over $500 dollars remains uncollected. If money comes in after the Union has purchased this year’s bicycles, the late-arriving money will be held for next years program. Contributors who donated this year included North Little Rock Fire Department members, city employees, and citizens. Local 35 would like to publicly thank the City Council of North Little Rock for allowing us time to announce collections during recent council meetings. We also thank Paul Myrick and Bob's Pawn Shop for serving as collection points and North Little Rock Fire for providing us with a place to store the bikes. UPDATE NOV 15, 2011: Both of the taxes were defeated, by a very close margin. First and foremost, we want the citizens of NLR to rest assured that the NLR Firefighters totally respect the outcome of the vote and the opinion of the voters. As always, we will continue to provide the best possible service and support to our community that was can. We've become very very skilled at "making do with what we've got" and will continue to do so! We would also like to take the time to thank the citizens who came out to vote; it is privilege as well as a right to do so, and voting is the most effective way for each citizen to have a say in how his community is managed. We have heard quite a few reasons as to why voters would select NO on these initiatives, and all of them are very strong and valid reasons. Local #35 is satisfied that no one ever voted NO because they felt like public safety didn't deserve the funds. The International Association of Fire Fighters Local #35, North Little Rock, by vote of it's membership, endorses and supports the upcoming tax initiatives. Resolution 7926 proposes a permanent 1/2 cent sales tax that will be used to fund critically needed public safety shortfalls, including the purchase of a new fire station with equipment and 13 additional firefighters; the hiring of 10 police officers to fill positions that have been left vacant; a replacement program for the aging police car fleet; and funding a necessary upgrade to the current emergency services radio system. Resolution 7927 proposes a temporary 1/2 cent sales tax that will last five years and will fund bridge and road replacements, Ward improvements, upgrades to our parks, and economic/business improvements that will include a business park area which will potentially be used to host the State Fair. Local #35 sees the first resolution as an immediate solution to needed public safety issues that have been on a steady decline in the past decade. We also feel that the second resolution will provide the City with more revenue-producing economic opportunities which, when brought to fruition, can be used to further improve services provided to the City and it's citizens. We are certain that the City Administration would agree that there have been many issues and differences between the City and Local #35. However, at this time, Local #35 believes that the passage of these two resolutions will ultimately provide the citizens with a better served and brigher North Little Rock. Officers of Local #35 will be at the public forum at the Willow St Police/Fire Training Facility on Thursday, November 3rd at 5:30 PM and will be happy to answer any questions anyone might have for us regarding the tax initiative. 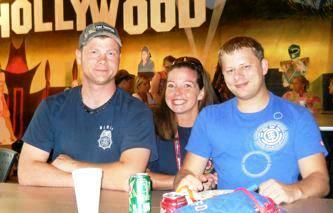 Four Union members from IAFF Local #35 attended this year’s Camp Sunshine, held August 18-21. Union Vice President Jon Miller and Trustee Chris Patton volunteered year-round as part of the Camp Sunshine committee that helps plan the camp and its activities each year; Patton also volunteered as a counselor to one of the burn victims attending the camp. Two other Union members, Alana Merritt and Brian Thomas, volunteered as counselors. As counselors, each person is paired with a camper of the same gender for four days and three nights. Camp Sunshine brings together young burn victims throughout Arkansas to Camp Aldersgate for a half week each August, providing several days of activities, bonding, and learning. The children’s burns range in severity and are in varying stages of healing. Marking the 20th anniversary of the camp, several counselors were recognized as former campers who’d returned as counselors. Other counselors included burn victims who had not attended Camp Sunshine as campers but who had heard of the camp through other means, nurses, and firefighters. In addition to NLRFD Local #35 Union members, firefighters from Jonesboro, Mountain Home, Springdale, El Dorado, Little Rock, Hot Springs and Benton assisted as staff, volunteers and counselors. To celebrate the 20th anniversary, Camp Sunshine chose the celebratory theme of “Hollywood” for this year’s camp, and female campers were treated to make-overs, professional hairstyling, and free formal dresses tailored on-site. Male campers had the choice of wearing suits brought from home or wearing one of the complimentary “tuxedo” shirts provided by the Camp. A visit by the Humane Society’s horse “Lucky Sunshine” allowed the campers to see up-close the local celebrity, whose near-fatal wounds have healed but have left dark scar tissue across his body. The horse, who was dragged down a highway for nearly two miles after falling out of a trailer driven by a drunk driver, was rescued by the Humane Society and saved by surgeries and skin grafts—something many of the campers are very familiar with. The kids also enjoyed a trip to the Hot Springs Crawler Park, where volunteers with off-road vehicles took campers and counselors on an hour-long trek through the scenic park, followed by lunch of grilled hot dogs and hamburgers. To volunteer a few hours, or to become a counselor next year, contact Lt. Jon Miller or FF Chris Patton for details. Two of the North Little Rock Fire Department's uniformed firefighters will participate in the 2011 World Police and Fire Games. This years Games are being held in New York City on the 10th anniversary of the tragic terrorist attacks on the World Trade Center. Battalion Chief Roger Robinson and Lieutenant Todd Hink will go to New York City on August 26th to compete in the games. Robinson will be competing in a swimming event, and Hink will compete in the Triathlon, the 10K Track and the 10K Cross Country events. 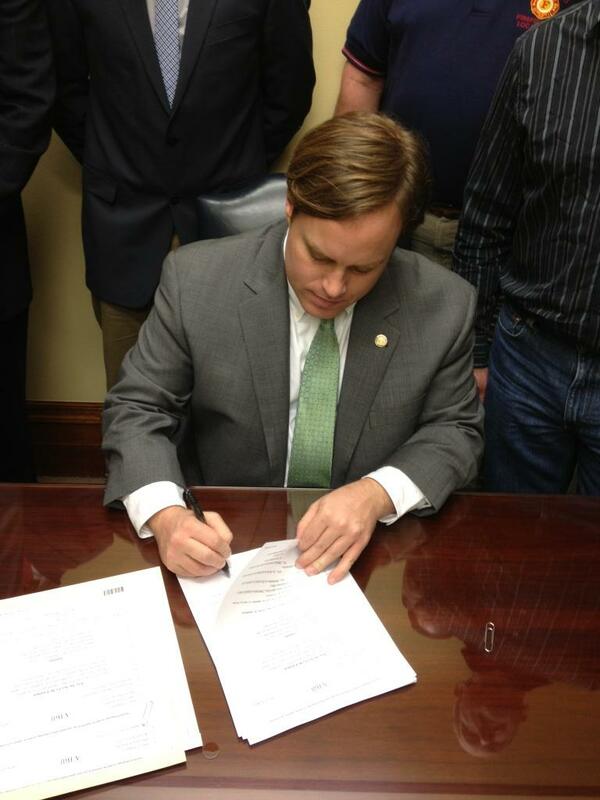 Both the City of NLR and IAFF Local #35 are providing financial assistance to get Robinson and Hink to the games. More information will be provided here as it develops. Additional information about the Police and Fire games can be found by clicking here.